My friends' daughter turned one last week, and I was lucky enough to be back in Richmond in time for the party on Saturday. I can't believe that it was just a year ago that Jess was 9 months pregnant, getting pulled down the aisle (bridesmaid!) by an overzealous groomsman who was scared to death that this guy's wife was going to pop at any second, all while wearing black stilletos. Yes, stilletos! Just one more reason I love this girl...9 months pregnant and wearing 4" heels! So, I go to the party on Saturday, and everything is just beautiful and well-planned. 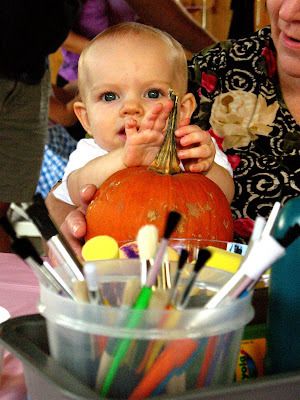 Amazing DIY projects to decorate the outside space, great ideas for favors and activities (pumpkins to paint for the little kids, and 5x7 canvases for people to paint as a keepsake for Riley), and a lot of wonderful people. As always, I brought my trusty camera with me to capture these once in a lifetime moments, but this time it was different. This time, I knew that my camera was not as reliable as it had been in the past. For some reason, the past few months have been filled with disappointingly grainy shots unless it is outside with 100% perfect lighting and no movement (aka portraits). The results of the party photos that day cinched it in my mind that it was time to retire the trusty old Canon Powershot A630 (just a point and shoot) and move into the big leagues. I always have wanted a dSLR, but I still have need for a P&S as well. Because of price point, the P&S has always happened first and, of course, the dSLR gets pushed further away in time. Not this time! This time I outsmarted myself and my old strategies for saving money! This time I figured that if I went ahead and bought the dSLR camera, if I really needed a P&S still, it would be much easier to drop $200-$350 on a new P&S camera than over 2x as much on a dSLR. So, there you have it- I am the proud new owner of a Canon EOS Digital Rebel XSi (and the Canon EOS Digital Rebel XSi/450D for Dummies book!)!!! I am so excited to start shooting (of course, it is rainy here today, so no outside photography). After talking with Trina at great length about different camera bodies that were in my price range (only Canon bc I am a loyal Canon customer!! ), the advantages and disadvantages of different features, and of course, the all important lens question, I decided to get the XSi vs. the XS because there was just a little more room for growth with the XSi. For an extra $150, I think I will be happier with it in the end. I'm off to learn more about my camera via the Dummies book now...it's the perfect time to take on a new project since Kenney is in Chicago at least until the end of December! Who would have thought this Circuit City girl would turn into a Best Buy shopper? One final photo for the blog shot with my PowerShot A630 (and of Riley's first birthday!). And now, a new era of photography (and, hopefully blog updates!) begins!! Congrats on the new Xsi. Have fun getting to know all the ins and outs. Ana and Blue are waiting for their glamour shots.